Union Industries, the UK market leading manufacturer of industrial rapid roll doors, has helped eradicate a potentially hazardous freezer ice build-up following its first installation at Hilton Meat Products Ltd. The Leeds-based company, which designs, manufactures, installs and maintains its own range of fast acting doors, has installed its innovative Eiger Freezer Door at the company’s site in County Antrim, Northern Ireland. Established in 1985, Hilton Meat Products Ltd packages meat products to strict hygiene and quality standards from its modern EC-approved plant in Northern Ireland. The door, which has been designed & made specifically to fit the 1770mm wide x 2610mm high opening, has been fitted in the main freezer area at the factory to replace a damaged traditional sliding insulated door. Hilton Meat Products Ltd experienced regular problems due to the build-up of ice around the door frame and floor at the opening, which was a potential health and safety hazard. The company has found Union’s Eiger Freezer Door to be a far more effective alternative to the traditional sliding door, which has solved their problem. On top of which, Hilton’s refrigeration systems are running more efficiently as moisture ingress into the freezer has been drastically reduced. Union’s rapid roll Eiger Door provides a superior alternative to the traditional sliding insulated type doors and also various other types of fast-acting freezer doors that are appearing on the market to try and compete with the Eiger. The door works to maintain temperatures utilising its high speed opening and closing operation. The innovative dehumidification process, which prevents ice build-up on the door blade, frame and workings, helps eradicate snow and ice forming around the opening and on the floors. After opening at approximately 1.6 metres per second, the Eiger Door closes automatically after a short dwell time, which allows for continuous traffic flow without compromising the freezer temperature. Warm air ingress into the freezer is drastically reduced, meaning companies can also benefit from the energy saving aspects of Eiger Door due to reduced cold store defrost cycles being required. 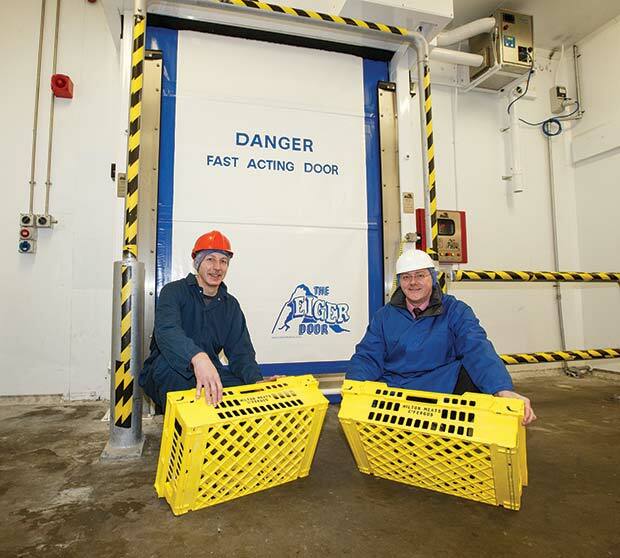 Operated via Pullcord activation on both sides of the opening, the door at Hilton Meats is in an ambient corridor to the main freezer and is used by pedestrians and forklift trucks.